The lines aren’t always nice and even. Study a U.S. atlas and you’ll find many supposedly straight boundaries with slants and zigzags in them, the work of surveyors who were—and it pains me to say this— borderline incompetent. Still, the remarkable thing isn’t how often the surveyors screwed up but how often they didn’t. You never know when we might be called on to lay out another virgin continent, and Lord knows, you can’t always count on modern technology. So here’s a primer on the oldfashioned way to draw a straight line on a bumpy planet. First, a question: Why straight lines? Mostly because the distant authorities who decreed borders—royalty before 1776, Congress and treaties after—were ignorant of local geography. Straight lines also had the virtue of simplicity. There are many Potomac branches for Virginia and Maryland to argue over. But there’s only one 42nd parallel, limiting the recreational disputation opportunities for folks in Pennsylvania and New York. Step 1. Understand that a straight line isn’t always a straight line. In surveying, then and now, one worker holds a pole while another trains a surveyor’s transit on him. They designate what’s literally a landmark, anything from a blaze on a tree to a stone monument. Then they move on to the next line segment. As long as they keep all the marks aligned, the result is a straight line, right? Step 2. Understand the difference between true north and magnetic north. Magnetic compasses don’t point to the north pole, but rather to a spot about 500 miles distant, a fact surveyors take into account when determining true north. Everybody gets this. What they may not get is that compensating requires constant adjustment as you move around. 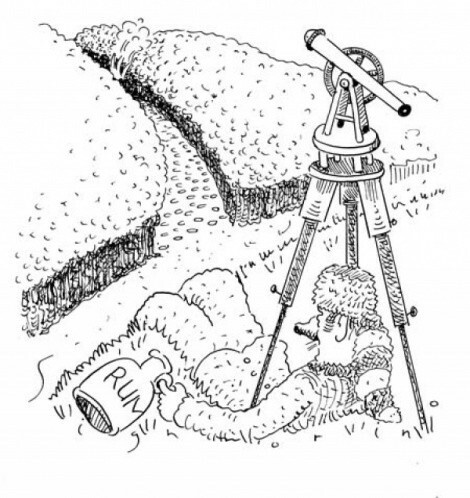 This subtlety was lost on some early surveyors. The knuckleheads who laid out most of the Virginia-North Carolina-Kentucky- Tennessee border didn’t realize they needed to adjust their adjustments, so as they headed west, the boundary curved north. The surveyors who handled the western end of the border, working east from the Mississippi, covered less ground and so had less chance to screw things up. Where the two lines meet at the Tennessee River, there’s a 12-mile jog still conspicuous on maps. Step 3. Establish true north. This wasn’t that hard to do in the old days. You just had to get up at a defined time in the middle of the night, sight on the North Star, and possibly make an angular adjustment. You then dropped your scope to the horizon and marked the spot with a lantern, and that was true north. What, you slept through? Then you had to take your chances with a magnetic compass, or else await the 1835 invention of the superior solar compass, which merely required precise knowledge of the time, latitude, and solar declination, plus, of course, no clouds. Step 4. Establish a starting point. Precision is obviously critical. Reportedly, surveyors took 3,000 observations trying to find the longitude of California’s northeast corner and still didn’t get it. To simplify matters, Congress sometimes specified that a boundary start at a landmark, but that wasn’t foolproof. The Missouri-Iowa border is supposedly marked by “the rapids of the River Des Moines.” The Supreme Court later had to decide: Which rapids? Step 5. Chop a slot through the forest. Drawing a bead on the guy holding the pole only works if nothing’s in the way—a challenge in colonial times, when the eastern third of the country was densely covered with trees. When Charles Mason and Jeremiah Dixon laid out their famous line separating Maryland, Pennsylvania, and Delaware in the 1760s, they had axmen hack a path through the woods called a visto. It was eight or nine yards wide, several hundred miles long. Comments, questions? Take it up with Cecil on the Straight Dope Message Board, straightdope.com or write him at the Chicago Reader, 11 E. Illinois, Chicago 60611.